Bait Station Brown Bear hunting is NOW LEGAL in one of our Guide areas. It is also a two Brown bear per year area. BOOK your Fall Brown Bear /Sport fishing combo now!!! 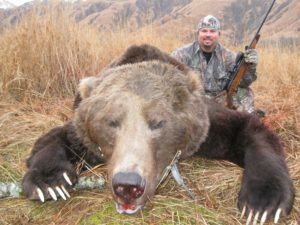 Prices include: 1×1 guide service, nine days hunting with tenth day reserved for travel, meals, in-field transportation, minimum of tent camp accommodations and trophy care. A 50% deposit is required to confirm hunt dates. The balance is due 60 days prior to hunting. Deposits will be forfeited unless space can be re booked. Our success rates are very good and we try very hard to not only provide Trophy Big Game but give our clients the experience of a lifetime! Custom hunts and special prices can be arranged. Just give us a call to work out the details. We can send you details on our Western Alaska Caribou hunts and Kodiak Brown bear hunts as well as any additional information you may need. If you have any questions or would like to book your hunt give us a call any time.